I managed to celebrate the centenary of American writer William S. Burroughs hooked up to a morphine drip and reading the last few chapters of Cervantes’ Don Quixote in the Chelsea and Westminster Hospital. I guess some things are just meant to be: on reflection I cannot think of a better way to commemorate the life of God’s Own Junkie than by becoming one yourself if only for the briefest of moments. To be honest, morphine proved to be the most indifferent of pleasures – the nurses and doctors had to keep reminding me to take it during the early stages of recovery from my surgery. Even so I had the grey bruised flesh and collapsed veins to go with the experience – although morphine can only be blamed for a small amount of the damage my body sustained while being plugged into the medical space station I inhabited during this time. On sleepless nights I would often listen to some of the Burroughs extended tape experiments contained on Real English Tea Made Here as if they were a radio serial – so the connections between morphine, cancer and cut-ups made real sense to me at the time. 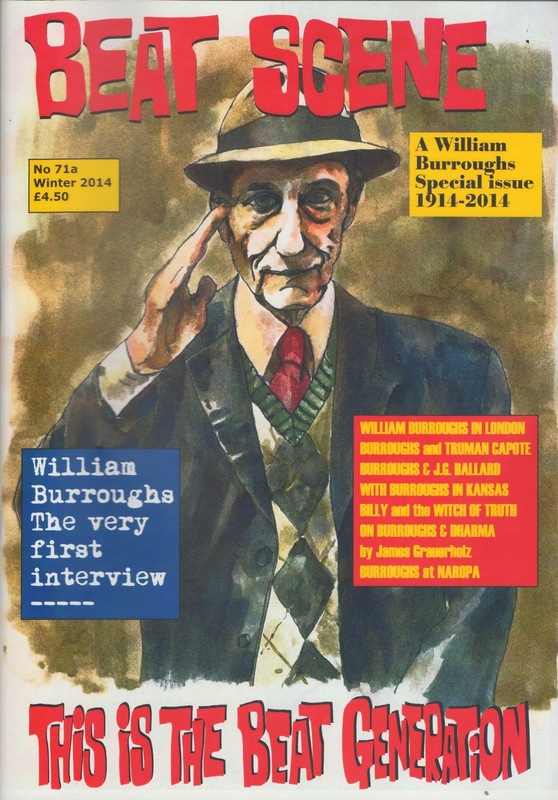 Soon after my discharge from hospital, I was handed a copy of the William Burroughs Special issue put out by Beat Scene to mark the 100th anniversary of the author’s birth. Included among the special features, essays and profiles, was the reprint of a short review I wrote of the William Burroughs ESP Disk release Call Me Burroughs, given an entire page of its own. 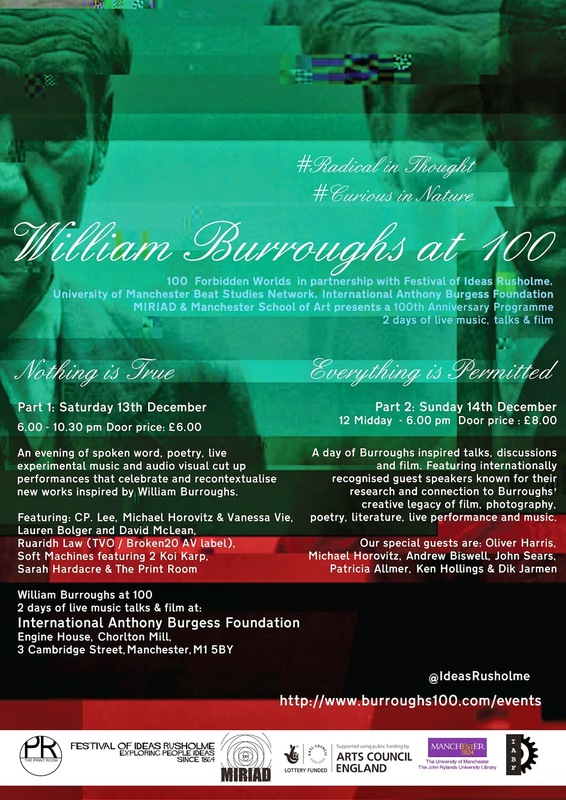 Apart from these experiences, I though that the centenary year would pass me by – however, I have been invited to speak at a special event devoted to William Burroughs in Manchester on Sunday December 14. Part two of a two-day festival, ‘everything is permitted’ offers a symposium on how we read and register Burroughs’s influence. Others taking part include Professor Oliver Harris, Michael Horovitz and Dik Jarmen. I will be reading relevant extracts from The Bright Labyrinth and talking about the film collaborations between Burroughs and Anthony Balch. There will also be a panel discussion about Burroughs. I am sure we will all think of something to say. I am of course delighted to have the opportunity to acknowledge in public the early influence Burroughs’ work had upon my own writing and thought.